Tolerance and intolerance are themes at the center of many contemporary debates, and their prominence has become stronger after the tragic events in France on January 7 and 8, 2015. On Internet these events have sparkled many reactions. Whatever my views and opinions, for me one of the questions arising is also how these events should influence the stream of postings on this blog. Can one use historical situations to shed light on our times, or Is it sensible to stay somewhat aloof? Perhaps it is wiser to remember that to step aside is taking a side, too. When somehow among all remarks and exchanges about the situation in France the name of Voltaire came into view it provided me with at least one element of a contribution about the origins of tolerance. Eighteenth-century France is the setting of this post. The history of tolerance is complicated, and the number of themes, persons and subjects here does reflect it. Philosophy, criminal law, legal advice, legislation, the world of literature and debate, and also images, should all appear here for good reasons, but for the sake of length legal matters will be at the center of this post, and other themes appear more at the margin. In fact it turns out to be really interesting to choose for this focus. To some extent you can read this post also as part of a guide to digital resources for the history of France during the Ancien Régime and the French Revolution. Although I do not want to make you suffer by reading a rather too long post I bring here on purpose several themes together which in my opinion are best seen in connection to each other. In my view the interplay between a multitude of subjects, themes and resources concerning the French Ancien Régime and the French Revolution is fairly typical when you want to study these subjects. You can read this post also as a sequel to my post ‘Laws and the French Revolution’ (January 2015). 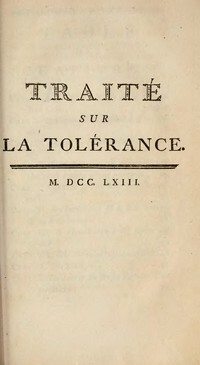 The first focal point for tolerance in France during the Ancien Régime in the current discussion seems to be Voltaire’s Traité de la tolérance (1763). One can read this treatise as a plea for tolerance, both on a philosophical and a practical level, and the background of this text can seem a mere pretext or occasion for expressing these views. John Locke had put tolerance center stage to thoughts about the best possible way of government in his treatise A Letter Concerning Toleration (1689 – online for example at Early Modern Texts and the Constitution Society), but Voltaire is not just reacting in a philosophical debate without any connection to contemporary developments. Locke wrote his treatise one year after the Glorious Revolution (1688), and this, too, should make you hesitate to see the history of political thought as a history of ideas which can be studied in separation from contemporary surroundings. Voltaire might not have qualified professionally as a philosopher, but he certainly belonged to the circle of French philosophes. It is important to note Locke expressed his views in a letter, and Voltaire in a book-length treatise, an interesting fact for a prolific letter writer and playwright. The literary dimensions of Voltaire’s work are really important in gauging the impact and importance of his views and thoughts. Of course it is wise to look beyond just one text of a writer, and exactly how you can realize this nowadays will be one of the issues in this post. Voltaire wrote texts in a number of literary genres, and he had wide contacts all over Europe, a fact returning later in this post. A characteristic of his work is the use of irony, and even more, the possibility to read his texts in several ways, both at face value or with a potential for irony immediately below the surface. This ambiguity makes it harder but also more interesting to gain a perspective on his views and coded messages. The initial impulse for Voltaire’s treatise on tolerance came from his reaction to the case of Jean Calas, a merchant from Toulouse who had been sentenced to death in 1762 by the Parlement de Toulouse for allegedly killing his son Marc-Antoine, presumably because his son wanted to convert to the Catholic church. Calas was subjected to torture and broken upon the wheel. If we remember this case today as a cause célèbre it is to a large extent thanks to Voltaire’s efforts. In an article from 1994, ‘Procès, affaire, cause: Voltaire et l ‘innovation critique’,1 Élisabeth Claverie analyzes the way Voltaire set out to make an affair out of this case, and indeed created the model for fueling public indignation about cases which seem to run contrary to the public good. Assembling materials to expose alleged and real abuses of the Catholic Church and its influence on French society might seem an obvious thing for Voltaire, but he did look seriously enough at the exact dealings of the judiciary in the Calas case. His treatise was only a final phase in a series of letters and preparatory texts, some of them meant for public use, some definitely not. 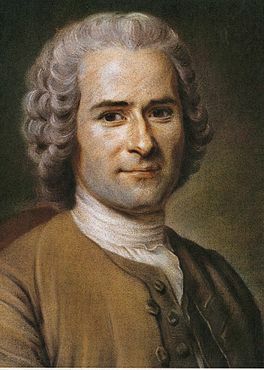 Voltaire used his connections to bring the case to the attention of the French king, including getting Calas’ widow to Paris to plead in person her case before the king. Whatever Voltaire’s views of harmful Catholic influence, he aimed foremost at an official rehabilitation of Calas. An online dossier by Anne Thouzet gives you detailed information about the trial at Toulouse, the infringements to the ordinance of the Parlement de Toulouse and royal ordinances about criminal procedure – in particular the Ordonnance criminelle of 1670 – and to various other documents and images. Thouzet also points to a number of relevant web links. The Archives départementales de la Haute-Garonne in Toulouse have created a PDF with transcriptions of some documents, ‘Calas, du procès à l’affaire’. By chance I remembered that you can find several digitized documents about the Calas case at Tolosana, a digital library of the Université de Toulouse. On closer inspection Tolosana does bring us not only documents touching this case, but a very interesting selection of materials concerning law at Toulouse during the Ancien Régime, with customary law, arrêts (verdicts) of the Parlement de Toulouse, documents about municipal institutions and other jurisdictions, documents about lawyers and law teaching at the university of Toulouse, and a separate section on trials (procès toulousains). Let’s not forget to mention here also the Bibliotheca Tholosana, a collaborative project, and Rosalis, the digital library of the Bibliothèque de Toulouse. In Rosalis you can find one of the most famous manuscripts for the history of the medieval inquisition in Languedoc, discussed here in earlier postings. The section of Tolosana for trials at Toulouse contains a distinctive number of mémoires judiciaires, also known as factums. In a factum cases were discussed for the general public and with a view also to the judges dealing with a particular case. A blog post by Léo Mabmacien about these factums leads you in particular to a selection of documents in a virtual exhibition created at Clermont-Ferrand, Les factums, justice des villes et des champs : le mémoire judiciaire du 17e au 19e siècle [The factums, justice in cities and fields. Judicial “memoires” from the seventeenth to the nineteenth century]. At the Bibliothèque nationale de France is the largest collection of existing factums, and in his very interesting post Mabmacien discusses these resources at Paris, too. The collection at Tolosana is at present the largest online collection of factums. Among the digitized documents for the Calas case is a number of mémoires judiciaires. Voltaire’s book-length treatise on tolerance is also included (PDF). In particular the mémoires published after 1762 are very valuable as sources for public and learned opinions about the case and efforts to annul the trial. At Bienvenue chez Monsieur de Voltaire you can find digital versions of the texts of a number of Voltaire’s letters (in the section En direct par Voltaire), in particular those concerning the Calas case. For the history of French criminal law you can learn much at the fine Criminicorpus portal – with both a French and English interface – and at the website Le droit criminel created by Jean-Paul Doucet. At both websites you can find the text of relevant royal ordinances dealing with criminal procedure. Remembering Tolosana was not just a case of having a good memory. In fact I wrote here about Tolosana and the Calas case in June 2010. Five years later I still feel astonished that these digitized documents have scarcely been used in contributions about Voltaire. Their value is seriously diminished by this omission. The French online research portal Isidore has entries for seventeen relevant documents digitized at Tolosana, but the tags attached to them do not function. No wonder that the online presence of the various documents has remained somewhat in the shadow. Internet is definitely an ocean where you have to know the entrances to particular information. Isidore, a portal focusing on the humanities and social sciences, has a search interface in French, English and Spanish. It did bring to my attention a recent Ph.D thesis about Adhémar Esmein (1848-1913), a famous French law professor and legal historian who did look at the Calas affair in his main textbooks on constitutional law [Antoine Chopplet, Adhémar Esmein et le droit constitutionnel de la liberté (thesis Université de Reims, 2012)]. Chopplet does not use these online documents for his study of Esmein’s view, but he does for example highlight the fact that Esmein did not comment on the fact that Voltaire himself had been a victim of the infamous lettres de cachet, one of the most glaring abuses of the French judicial system during the Ancien Régime. Esmein admired Voltaire for his detailed criticism of criminal procedure in his writings about the Calas affair. Montesquieu was perhaps much better equipped to do this, but on this subject he remained silent. In an even more recent Ph.D thesis available online at the Theses platform, La pensée politique d’Adhémar Esmein : l’historien du droit by Alexandre Fiorentini (thesis Aix-en-Provence, 2014), the interplay between Esmein’s political position and his views as a legal historian is further discussed. By now it should be obvious that bringing together all these materials is only possible and feasible thanks to the use of linked computers. However, how can one safely digest these masses of information, and analyze them in a controlled and sensible way? Having the information at your disposal is one thing, using the right tools for analysis is another, and presenting a meaningful analysis should be the real challenge. Dealing with the Calas case can show you the use of some digital tools and projects. Perhaps it is good to stress here that I only show some of their highlights, not their entire scope. However you think about my plea for a consistent use of the contemporary ocean of online materials, but it is wise not to neglect good bibliographical research. French research in the field of legal history can be tracked down online using the services of the Bibliographie d’histoire de droit en langue française (CLHD, Nancy) which can be consulted both in French and English. A simple search for Calas brings you to eleven titles published since 1964. Using the thesaurus (“Procès-Affaire Calas”) you will find ten titles. Earlier this year I already wrote here about this bibliography. A number of French research portals help you to find quickly online versions of articles. The oldest portal Persée gives access to digitized issues of a number or well-known learned journals. For the Calas case you can find for example an article on the concept of proof by Jean-Louis Halpérin.2 A second interesting article is by Frank Kafker who discusses the role of Diderot who did not speak out about the Calas case in public, but behind the screens he used his influence and did write people about it.3 Another scholar discusses the general attitude of Diderot towards political actualities.4 The OpenEdition initiatives is not only home to the Hypotheses network of scientific blogs in French, German, and Spanish, but also the provider of a number of online journals at Revues, many of them completely or partially available in open access. Among the most relevant journals for my theme here ise the Annales Historiques de la Révolution Française. Revues points for instance to the book by Janine Garrisson, L’Affaire Calas, miroir des passions françaises (Paris 2004) in an alert by Jacques Bernet [AHRF 354 (2008) 202-203]. At one of the blogs at Hypotheses, Criminocorpus, you can find a notice by Jean-Claude Facry about the recent study by Benoît Garnot, Voltaire et l’affaire Calas. Les faits, les interprétations, les enjeux (Paris 2013). Facry provides an overview of its contents. At the Criminocorpus portal itself is the History of Justice Online Museum, a very useful section with virtual exhibitions. It is certainly worth looking at the exhibit on Les exécutions publiques dans la France de l’Ancien Régime (only in French). OpenEdition publishes also online books, one of them a volume of articles about L’exécution capitale : Une mort donnée en spectacle, Régis Bertrand and Anne Carol (eds.) (Aix-en-Provence 2003), unfortunately not in open access, where you should look at the contribution of Robert A. Schneider, ‘Rites de mort à Toulouse : les exécutions publiques (1738-1780)’. At Cairn you can look at some 400 scholarly journals. A search for the affaire Calas yields nearly 200 results. For the book by Janine Garrisson you can find a review by Laurence Kaufmann in Annales. Histoire, Sciences Sociales 61/4 (2006), who mentions in particular a study by David Bien, L’affaire Calas. Hérésie, persécution, intolérance au XVIIIe siècle (Toulouse 1987). The search results at Cairn help you to find recent French literature on themes such as major trials, for example Les grands procès, Daniel Amson et alii (eds.) (Paris 2007) or a brochure by Jacques Vergès, Les erreurs judiciaires (Paris 2002) that appeared in the famous Que sais-je? series. Closer to the Calas affair is the volume of essays La plume et le prétoire. Quand les écrivains racontent la justice, Denis Salas (ed.) (Paris 2013 ), a special of the journal Histoire de la justice 23/1 (2013) with a pertinent article by Sylvie Humbert, ‘L’autre justice de la Dictionnaire philosophique‘ (p. 81-87), one of the publications of Voltaire during the 1760´s. An article by Lynn Hunt, ´Le corps au xviiie siècle´, Diogène 203/3 (2003) 49-67, helps us to remember that the first major treatise against torture, by Cesare Beccaria, Dei delitti e delle pene, only appeared in 1764, and to notice also it was not the abuse of torture that prompted Voltaire into action in 1762. In 1766 Voltaire wrote a Commentaire sur le livre des délits et des peines. In view of the sheer length of this post I would rather not adduce here more examples of the results made available through the services of Persée, OpenEdition, and Cairn. If you want to look beyond recent French publications you can enlist the services of JournalsTOCs to get quick access to the tables of contents of many scholarly journals. A nice array of legal history journals in open access is available in the right sight bar of my blog. With the Dictionnaire philosophique of Voltaire we touch the Republic of Letters. The world of European networks in the period of French hegemony deserves separate treatment here. I would have preferred to include a substantial section on it here, but wisdom tells me it is better to leave you here, albeit somewhat in suspense. French historians have not been content with creating just one view of the Calas affair. They came back to it again and again, and it can even serve as a kind of thermometer of someone’s position. In this post I have tried to show some of the materials now available that have only seldom been used in connection with this case. In fact you can use the digital resources mentioned here also for the study of other subjects. Jean-Paul Doucet gives a nice list of famous trials on his website, and it my view it has become much easier to gain a head start using online resources than earlier on. This tournant numérique, this digital turn of doing history, is not only a matter of easy access to primary sources. Bringing into view resources scarcely considered before or almost forgotten, can broaden and deepen the way we look at all kinds of history, including legal history. In my opinion connecting legal history with history at large is one of the urgent needs of legal historians. It is up to me and you, to my and your creativity to make the digital turn fruitful and important. I published a new post in this series in March 2016, ‘Images and the road to the French Revolution’. 1. Élisabeth Claverie, ‘Procès, affaire, cause: Voltaire et l’innovation critique’, in: Parler en public, a special issue of Politix. Travaux de science politique 7/26 (1994) 76-85; online at Persée. 2. Jean-Louis Halpérin, ‘La preuve judiciaire et la liberté du juge´, Communications 84 (2009) 21-32, online at Persée; special on Figures de la preuve. 3. Frank A. Kafker, ‘Le rôle de Diderot dans l’affaire Calas’, Recherches sur Diderot et sur l’Encyclopédie 21/1 (1998) 7-14, online at Persée. 4. Hédia Ouertani-Khadhar, ´Diderot et l’actualité politique´, Recherches sur Diderot et sur l’Encyclopédie 18-19 (1995) 93-103, online at Persée. Lately I discovered two digital collections with digitized factums. Legal materials from the Auvergne, a region where customary law hold sway, have been digitized at Clermont-Ferrand for the Overnia portal, with among them a few hundred factums. At the Internet Archive the Bilbiothèque Sainte Geneviève in Paris has published nearly 900 digitized factums and mémoires judiciaires. In 2016 I discussed factums and mémoires juridiques at length in a post. The ARTFL project (University of Chicago) and the Voltaire Foundation (University of Oxford) have created a Philologic4 version of Tout Voltaire, the project for an online edition of Voltaire’s works. This entry was posted in Digital editions and tagged Ancien Regime, Criminal law, Digital archives, Digital libraries, France, French Revolution, History of ideas, Legal history, Political history on June 25, 2015 by rechtsgeschiedenis. The French Revolution remains a most interesting and influential period of French history, with an impact far beyond the borders of France. Its great events, the shifts in power and the colourful personalities make it into a subject which continues to hold worldwide attention. At the center of change were the activities of the French national assembly. Revolutionary decrees and laws were one of the prime factors changing many aspects of French society and daily life. Two new digital portals help researchers to access online a veritable treasure trove of relevant materials. In this post I will make a tour of them. This post aims also at laying the foundations for further postings about French legal history. In fact it is solely for reasons of economy and for the comfort of readers that you will find a nucleus of materials lifted out from a larger context. Rather than causing confusion by publishing a very long post with lots of threads I invite you to wait how this post connects with upcoming posts about France during the Ancien Régime and the French Revolution. How closer one comes to contemporary history, the more overwhelming the sheer masses of information become. The sheer scope and scale of dealing in any depth with France during the Ancien Régime has become more impressive since you can command a wealth of resources from your computer screen, but in fact you are faced with mountains of information. It used to take great efforts at research institutions in Paris to get access to materials. My supervisor at Rotterdam, the late Chris ten Raa, became during the sixties nourri dans le sérail doing research in Paris on French judicial institutions created during the French Revolution. I am sure he would have delighted in having so much more at your disposal at touch screen distance. This does not displace the immediate contact with sources and knowing your way in French archives and libraries, but it does most definitely enlarge the scale of research. Chris ten Raa had been intrigued by Voltaire’s remarks about the juge de paix, a lay judge dealing with cases in a prejudicial phase, and thus bringing justice much quicker and closer to people. Voltaire wrote approvingly about such judges active in Leiden. How much did he influence the eventual plans for installing juges de paix as part and parcel of French judicial reform? Before he became a legal historian Ten Raa himself had worked as a judge. He looked at the cahiers de doléances of 1789 and traced the discussions in the French revolutionary assemblies leading to the law proclaimed on August 16, 1790. He described the early history of an institution which the French also brought to Belgium, the Netherlands and the French territories in Germany. He published the results of his research as De oorsprong van de kantonrechter [The origin of the juge de paix] (thesis Rotterdam; Deventer 1970). At Rotterdam he led in the nineties an international project with the Centre d’Histoire Judiciaire (Université de Lille-2) to investigate in more depth the workings of these judges and other French legal institutions, for example the conseil de famille, which had come to other countries as legal transplants. A very recent study on this subject was published by Guillaume Métairie, Justice et juges de paix de Paris (1789-1838), Étude institutionnelle et biographique (Limoges 2014). The two portals in this post, too, are the fruits of international cooperation. The ARTFL project (American and French Research on the Treasury of the French Language, University of Chicago) was involved in the project for the digital version of the Collection Baudouin, now accessible at a website of the Université de Paris-I (Panthéon-Sorbonne). Other institutions were involved, too, for the realization of this portal, for example the Archives nationales. This digital collection offers you nothing less than a searchable version of the décrets et lois of the Assemblée Nationale between 1789 and 1795. A complete set of the 67 volumes of Baudouin’s collection, the Collection générale des lois, is very rare to find. The famous dictum Nul n’est censé ignorer la loi, nobody is supposed to be ignorant of the law, can now become true when you can deal at your finger tips with more than 20,000 laws and decrees. François-Jean Baudouin was the publisher who faced the challenge to publish the vast stream of legislation, and the portal offers information about his life and work. The database with the decrees and laws can only be viewed in French. You can access the laws by volume which brings you images of the printed editions (mode image) or by looking for particular texts (mode texte). At the web page for the first search mode you will find also a link to a tool for converting revolutionary dates into normal dates according to the Gregorian calendar. The recherche dans le texte is an advanced search mode. I looked for the law concerning the juges de paix of August 16, 1790, and I could quickly find it. These judges do not appear in the title of this law, one thing that made searching for them in the printed volumes rather cumbersome. Other elements of the portal deserve attention, too, such as the two glossaries for common French words and for proper names which both often appear in variant spellings. There is a section with information about recent publications about French revolutionary legislation, some of them available online, and a section on scholarly events accompanying the work on this portal. Of all sources and resources about the French Revolution you find here at one point access to its very fountain head. It is here you can trace in the préambules the echos of proposals made by the French philosophes and by Frenchmen themselves in the cahiers de doléances. Before going to the second portal I would like to mention some of the digital resources offered by the Archives nationales. In its ARCHIM database are French constitutions since 1789 and a selection of 42 documents about the French Revolution, and since 2014 also twelve digitized manuscripts of Robespierre. The links selection of the Archives nationales is also very helpful. Initially I missed here the Base Choiseul for searching French treaties, but this database has recently been integrated with the Pacte database for traités en vigueur (treaties in force) into the Base des Traités et Accords de la France, where you can find also a useful survey of treaty collections. Stanford University Libraries have partnered with the Bibliothèque nationale de France (BnF) for the magnificent bilingual portal French Revolution Digital Archive/ Archives numériques de la Révolution française (FRDA/ANRF). There are two main sections, the digital edition of the Archives parlementaires for the years 1787-1794, and Images of the French Revolution. For some reason I thought these images came from the Institut d’Histoire de la Révolution Française (IHRF). A reshuffling of its materials has made the website of this research institute at present rather confusing. For some years after 1794 the IHRF offers at least links to digitized versions of the Bulletin des lois (1795-1799, 1804 and 1806). For reasons of copyright the FRDA portal contains only those volumes of the Archives parlementaires published before 1914. The series started as a governmental initiative but soon scholars took over the project. The editions give us in chronological order not only parliamentary deliberations, but also the full text of letters, reports and accounts of events by journalists. The 82 volumes now available online deal with the period from May 5, 1789 until January 4, 1794, and are supplemented by a list of the remaining volumes for 1794. You can use a free text search, but also narrow your searches to particular periods and persons. Further limits can be set to a particular volume, assembly, reports of séances (sessions) or other resources, and even to people surrounding a particular person. ARTFL offers for the Archives parlementaires a separate search interface for working with the Philologic4 tool for philological research. At the FRDA portal you can follow not only the deliberations of the representatives, but it is also possible to read online a number of cahiers de doléances in the edition of the first six volumes of the Archives parlementaires. The website of the Archives de France have created a very useful overview of online resources, with for example at four archives départementales digitized cahiers de doléances [for the AD Charente at Angoulême, AD Haute-Loire (Le Puy-en-Vélay), AD Maine-et-Loire (Angers) and AD Hautes-Pyrénées (Tarbes). At WikiGenWeb is an overview of digitized records in French departmental archives, with also digitized cahiers de doléances at the AD Tarn (Albi), AD Loire-Atlantique (Nantes), AD Nièvre (Nevers; série 1 L 161-162) and AD Saône-et-Loire (Mâcon). I hesitated to give you here the full links, but at some websites the actual links are not easily spotted. Of course you can go to Gallica to find much more, but it is good to see these primary sources in their original settings. Viewing the original documents helps you to appreciate the value of later scholarly editions. For some subjects there are separate critical editions in print of cahiers de doléances. The Bibliothèque nationale de France offers within its Gallica digital library a fine selection Essentiels du droit, with in its first section sources législatives et réglementaires. For the French Revolution you can find such series as the official Bulletin des lois de la République Française, available from 1789 to 1931, the Collection Duvergier with laws, decrees and ordinances from 1788 to 1938, and the Recueil général des anciennes lois françaises (“Collection Isambert”; 29 volumes, Paris 1822-1833). Jurisprudence starting from the late eighteenth century can be found in several series of sources jurisprudentielles, among them the still existing Recueil Dalloz. The sheer impact and continuity of the French Revolution and the subsequent incarnations of the French republic is nowhere more clear than in these series, although it might seem a drawback that you cannot not find so easily sources for a more narrow period. However, among the eternal questions surrounding the French Revolution is the very question when it ended. The French Revolution is the classic case for looking at both continuity and discontinuity, for beginnings and endings which can be seen from an infinite number of angles. The material sources of French laws between 1789 and 1795 are the subject of a recent special of the French online journal Clio@Themis. For French legal history the support of the Bibliographie d’histoire de droit en langue française (CLHD, Nancy) is most welcome. Its database can be consulted both in French and English. The liberal use of keywords in the thesaurus (“topics”) search helps you to search systematically for a particular subject. For the French Revolution and for legislation you can distinguish between scores of subjects and themes. It brings to your attention several reference works, for example the Dictionnaire de l’Ancien Régime, Royaume de France, XVI-XVIIIe siècles, Lucien Bély (ed.) (Paris 2005), the Dictionnaire de la culture juridique, Denis Alland and Stéphane Rials (eds.) (Paris 2005) and the massive Dictionnaire critique de la Révolution française, François Furet and Mona Ozouf (eds.) (5 vol., Paris 2007). The emphasis in this bibliography is on publications in French. Of course there are books missing, for example Edna Hindie Lemay (red. ), Dictionnaire des Législateurs, 1791-1792 (2 vol., Ferney-Voltaire 2007). However, her Dictionnaire des Constituants, 1789-1791 (Oxford 1991) has been included. You can read online Lemay’s posthumously published article ‘Les législateurs de la France révolutionnaire (1791-1792)’, Annales Historiques de la Révolution Française 347 (2007) 3-28, an article that she had wanted to be read alongside her second dictionary. It serves indeed as a quick guide to the differences and continuities between the people building the Assemblée constituante and the Assemblée législative. Recently Patrick Arabeyre, Jacques Krynen and Jean-Louis Halpérin published the second edition of their Dictionnaire historique des juristes français, XIIe-XXe siècle (Paris 2015). Let’s finish this paragraph with yet another dictionary, this time available online in French and English, the Dictionnaire Montesquieu, a guide to the history of political thought in eighteenth-century France. A number of its articles deal with law and justice, and it can serve as a reference work. The dictionary is a part of the Montesquieu project at the École Normale Supérieure de Lyon. With Montesquieu we crossed the border between the French Revolution and the Ancien Régime, and between the people giving laws to a new nation and the authors inspiring them. I find it difficult to stop here when it is so clear that these two magnificent portals for the legal history of the French Revolution should be and are at the center of a veritable galaxy of other resources. Studying and researching the French Revolution has become a specialized industry. In a sequel to this post I will take my lead from a part of the FRDA portal which I have left out here, its image database, and I am sure I will discuss other resources as well. For everyone wanting already to find out more about the French Revolution I can at least mention here some online resources, and what follows is definitely only a selection. Normally the website of the IRHF should be a starting point, especially in combination with the online journal Annales Historiques de la Révolution Française. In the absence of an online version of the Bibliographie annuelle de l’histoire de France, the French general historical bibliography, you can gain information about relevant publications in the Bibliographie nationale française, with publications since 2001, a service of the BnF, and in Benoît Melancon’s XVIIIe siècle: bibliographie (Université de Montréal) with publications from 1992 onwards. A resource in German, the WebGuide Geschichte at Historicum, is most useful, certainly when combined with the section concerning the French Revolution at this history portal, with in particular its Bibliographie bicentenaire. The archived version of a special subdomain of Historicum about the French Revolution is worth checking, too. The online journal Révolution Française. L’esprit des Lumière et de la Révolution brings articles and notices in a well-organized fashion, and in some cases quick access to online materials. In its section Éditions you can go to online versions of two recent books about such figures as Barnave and Marat. I cannot think of a better end here than bringing you back to Chris ten Raa who remained a faithful visitor of the Bibliothèque Cujas in Paris. Its printed and online resources – including Cujasnum, its own digital library, and its online Iurisguide – will continue to support any research into French legal history. A second article in this series appeared in June 2015, ‘Some notes on the history of tolerance’. A third post came in March 2016, ‘Images and the road to the French Revolution’. A fourth post looks at legal briefs before, during and after the French Revolution (‘Legal rhetorics and reality in Early Modern France: The factums’). Among my earlier posts you might want to look at ‘Rousseau at 300 years: nature and law’ (2012). The Centre d’Études et Recherche sur l’Action Locale announced recently the funding from 2015 to 2018 of a project for the sequel to the Collection Baudouin, sometimes cryptically abbreviated as ANR RevLoi. The code name LexDir 1795-1799 stands for the laws issued under the Directoire; the project team – with all partners from the first project – will deal with some 21,000 acts. The project description contains a useful bibliography on resources and relevant scholarly literature. For the history of the French parlements there is an online bibliography BibliParl, an offspring of the project of Isabelle Brancourt for the Parlement de Paris. This entry was posted in Digital editions, Scholars and tagged Digital archives, Digital humanities, Digital libraries, France, French Revolution, Legal history on February 14, 2015 by rechtsgeschiedenis. Looking at my recent postings I became aware of a common theme connecting them: both in my posting on South Africa and apartheid and in the posting about the mirror of society offered by the beast epic Van den vos Reynaerde views of human nature are at stake. From the viewpoint of legal history it might seem a small step to human rights. Just how great the step is for humanity was at the centre of a lecture at Utrecht University on the history of human rights by Lynn Hunt, a historian from UCLA well-known for her books on the French Revolution. Thursday Lynn Hunt’s starting point was her book Inventing Human Rights (New York 2007). She did not repeat the lecture shown on YouTube and on University of California Television! Instead Hunt presented her conclusions as a set of propositions which she then more or less illustrated. In her perspective the concept of human rights came to the fore very suddenly on a wave of interest which started around 1760. The change in views about human nature, if not partially created, were at least stimulated by the new genre of the epistolary novel which invited readers to sympathize with the characters of the novel. It is not just in the sphere of the law, and more precisely of criminal law and punishments, that we should look for motives for and supporters of legal change, crowned by such documents as the 1776 Declaration of Independence and the Déclaration des Droits de l’Homme of 1789. What happened between 1760 and 1789? Hunt looks for the interplay between cultural, social and political developments, and rightly so. The suddenness of the coming of human rights makes the title Inventing Human Rights an echo of The Invention of Tradition (Cambridge 1983), the volume of essays edited by Eric Hobsbawm and Terence Ranger. Utrecht University and UCLA have an exchange program since 2001, founded by Margaret Jacob (UCLA) and Wijnand Mijnhardt (UU). This year the two of them together with Lynn Hunt have edited a volume of essays, Bernard Picart and the First Global Vision of Religion (Getty Research Institute, 2010), and The Book that changed Europe. Picart and Bernard’s Religious Ceremonies of the World (Belknap Press, 2010). A website with a full facsimile of the four earliest versions of Cérémonies et coutumes religieuses de tous les peuples du monde, originally published at Amsterdam between 1723 and 1743, accompanies both books. Jean Frederic Bernard wanted to present the rituals of all known religions and he got the engraver Bernard Picart to illustrate the nine volumes of the first edition. These books and the splendid website evoke for me at least four remarks. First of all venturing into social history, law, art history and much more shows Lynn Hunt’s scholarly capacity to cross frontiers and to connect different fields of research in a fertile way. Secondly, the growth of religious tolerance is coupled with the establishment of a vision of worldwide mankind, which contributes indeed to a cultural change, and this view of man and mankind influenced the concept of human rights. Thirdly, Bernard’s and Picart’s ventures slightly predates the French eighteenth century vogue for encyclopedic works in the wake of the Encyclopédie of Diderot and Voltaire published between 1751 and 1772, but it surely made some minds already more open. The fourth point is the evident role of illustrations in the success of these works, and this brings me to the subject of legal iconography. Lately I have been busy searching for digital libraries concerning legal history, which I present on my legal history website. Having collected a fair number of digital libraries it becomes clear that more is needed and possible. Archives presenting digitized documents and institutions with different kinds of material contribute as much to legal history as classic libraries presenting mainly digitized texts. At some universities Law and Humanities has become a regular subject. It would be to the benefit of both legal historians and scholars in the humanities and social sciences to revive legal iconography. Since this is only a posting I will not try to present here a full list of interesting websites, but only mention some of the more classic collections for legal iconography. The University of Graz (Austria) has a database for legal iconography. The University of Munich and the Bayerische Staatsbibliothek have digitized the collection on legal iconography of Karl von Amira. The Max-Planck-Institut für europäische Rechtsgeschichte at Frankfurt am Main has put the collection of Karl Frölich on its intranet; you will have to visit Germany to use it. Of the former Dutch Centre for Legal History and Legal Iconography at the Royal Library (KB) in The Hague the iconographic database is accessible for KB card holders. Its bibliographical documentation and its thesaurus, too, survive on the web, the former has been integrated into the Digital Bibliography for Dutch History. In due time I hope to present more on my website. Let’s return to Lynn Hunt and the history of human rights: of course she had to mention such landmarks as Cesare Beccaria and Voltaire’s comments on the Calas affair. Jean Calas was tried at Toulouse. Tolosana, the digital library of old books at the Université de Toulouse, contains a substantial number of legal works from eighteenth century France, including at least 23 books and documents concerning the cause célèbre of Calas. No doubt it remains difficult to pinpoint exactly the start of the concept of human rights, but at least it is clear this concept was not invented as recent as 1948 with the Universal Declaration of Human Rights. Awareness of the history of human rights can help to understand the slow progress of human rights. This last miserable fact can be researched using the database at the documentation centre of the Netherlands Institute for Human Rights at Utrecht. And a reminder about iconography: at Utrecht University you can use a copy of the Index of Christian Art, both the card files and the database. A postscript: a fine history of views on mankind and humanity has been written by Siep Stuurman, De uitvinding van de mensheid. Korte wereldgeschiedenis van het denken over gelijkheid en cultururverschil [The invention of mankind. A short world history of thinking about equality and cultural difference] (Amsterdam 2009). This entry was posted in Digital editions and tagged Books, France, French Revolution, Human rights, Legal history, Legal iconography, Nature on June 18, 2010 by rechtsgeschiedenis.